When it comes to fairness creams, it becomes a really tedious job to find the best match for your skin. Sometimes, the fairness cream turns out to be too oily, sometimes too matt, and sometimes it completely fails to fulfill its purpose. And most of the times, these fairness creams turn out be a total waste of money, time and effort. Since every girl has a unique skin type and skin changes with every season and weather, the choice becomes all the more difficult. After being a consistent user of Olay Natural White Day and Night cream, I recently made my move to L’Oreal White Perfect Transparent Rosy Whitening range (both Day cream and Night cream). My oily to combination skin that becomes normal to dry in winters started behaving really weird this season. 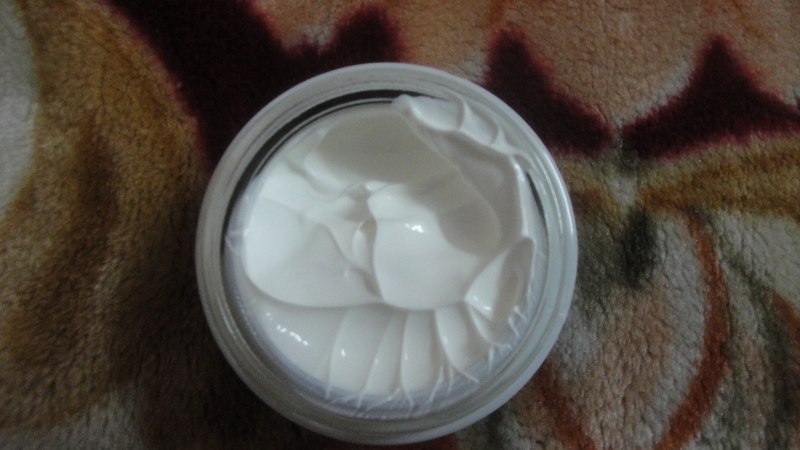 And my favorite Olay Natural White Day cream that I always use in winters broke me out this time. Luckily, hubby got this new L’Oreal White Perfect Transparent Rosy Whitening kit containing day cream, night cream and a vibrating eye cream from one of his business trips abroad at a time when I needed it the most! Imagine my happiness and excitement! Although, I haven’t started using the eye cream as yet, it’s been almost a month I’m consistently using the L’Oreal White Perfect Transparent Rosy Whitening Day Cream and night cream in my skincare regimen. 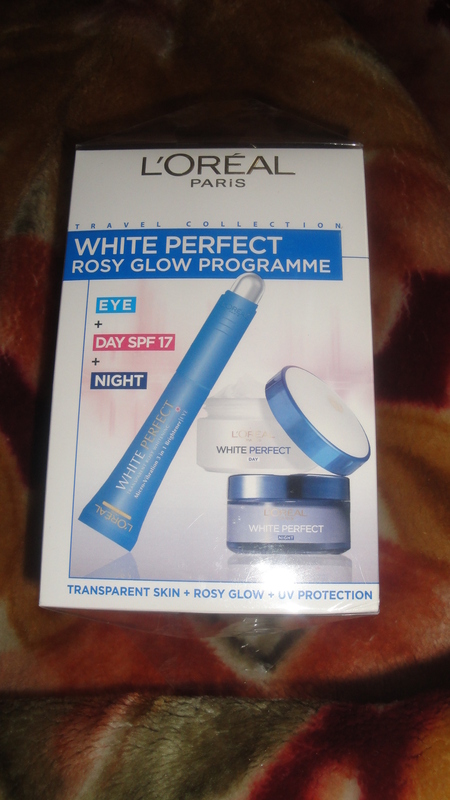 So here comes the review of L’Oreal White Perfect Transparent Rosy Whitening range. However, due to time constraints I’ll limit this post to review of the day cream. 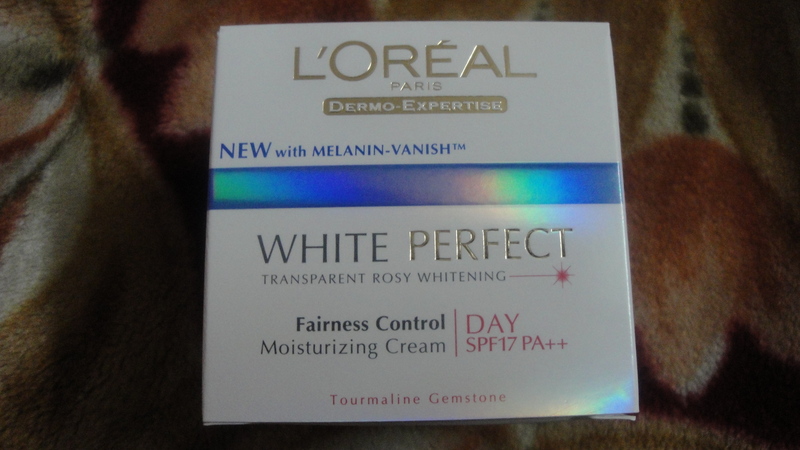 Since this fairness cream comes from L’Oreal Paris, brand to reckon with, I obviously had high expectation from this whitening range from L’Oreal. The day cream comes in a transparent glass jar with an attractive blue and white lid. It contains SPF 17 with PA++, which I feel is sufficient sun protection for Indian winters. The cream is enriched with advanced melanin block to lighten skin tone and reduce spots by stopping melanin formation. It also contains a special ingredient called Pink Tourmaline, a semi-precious gemstone that claims to stimulate skin micro-circulation and bring glow to the skin. Its milky white in color and has a thick consistency. For testing I took a small pea sized amount on my finger and applied it all over my face. Although, the texture seemed heavy on my finger, to my surprise it spread very lightly and evenly on my skin. It perfectly moisturized and brightened my face almost immediately upon applying. I loved the way it felt and looked on my skin. I rechecked my face in the evening and was delighted to see no sign of any oiliness, greasiness, redness or stickiness on my skin. My skin looked as soft, fresh, and bright as it looked in the morning. Also, I felt this cream reduced my pore size to make my complexion look brighter, smoother, and more transparent. It’s now been a month I’m using this cream and must confess my skin does look brighter and even. 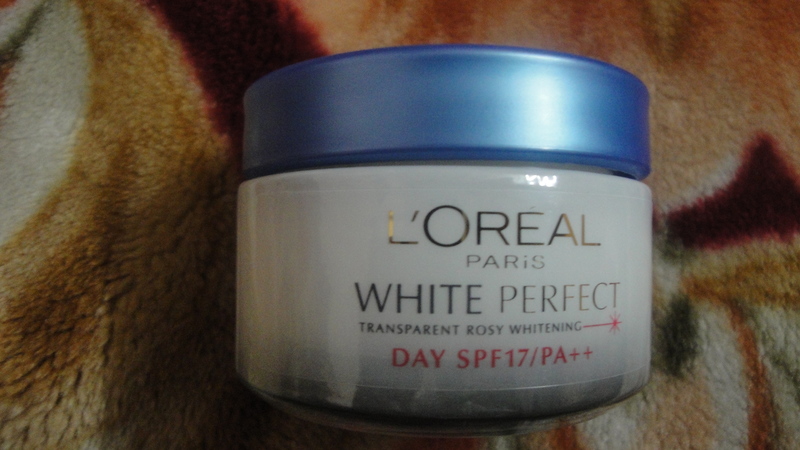 As for me, this L’Oreal White Perfect Transparent Rosy Whitening Day Cream has really come out fair on most of its claims and fulfilled all my expectations. So even though, it won’t turn you into a rosy fairy overnight, but it will indeed help in brightening up your complexion overtime with consistent use. Also, the claim to reduce or fade dark spots is far-fetched as I haven’t noticed any improvement or reduction in my dark spots. 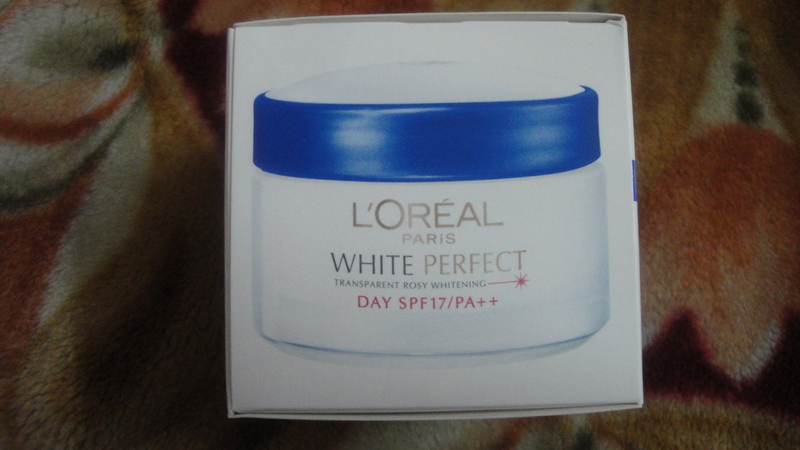 Overall L’Oreal White Perfect Transparent Rosy Whitening Day Cream is a perfect fairness cream or moisturizer for oily/combination skinned beauties in winters. It hydrates well and brings on an instant glow thereby brightening overall complexion. While, it does fulfill most of its brightening claims, it does not effectively reduce dark sports or permanently whiten complexion. It may not be suitable for oily skinned beauties in summers or dry skinned beauties during winters. 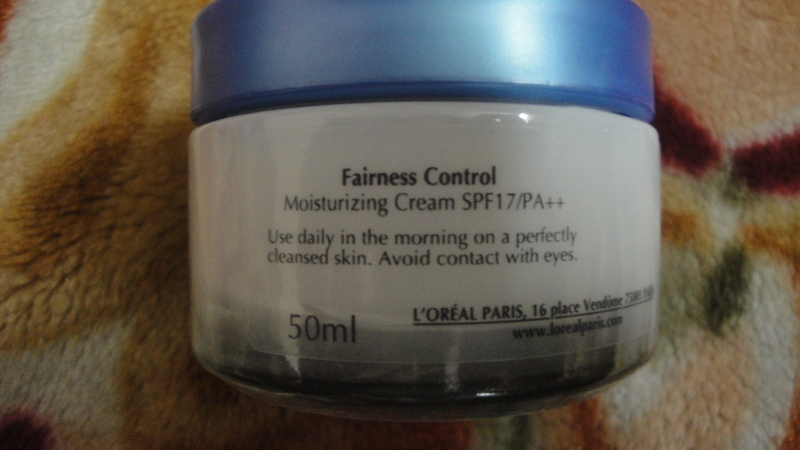 I highly recommend this fairness cream from L’Oreal to oily/combination and normal skinned girls for winters. The added SPF rules out the need for a separate sunscreen. Gender – Male 👨, I would like to try this product,before that i want to let you know that i am having oily skin,so can I apply day cream also in summer.i have purchased this pr.what do you rec pls let me know. Hi Biji. Thanks for writing in. If you have oily skin, I wouldn’t suggest you to use this cream in summers. Wait until winters, when skin is on the drier side to use any rich day cream. However, you can safely use any light day moisturizing lotion or non oily sunscreen during hot and humid weather conditions. Hope this helps. All the best. loreal night cream is best or olay night cream? If your concern is whitening/brightening, then in my personal experience and opinion, Loreal is better than Olay. But if your concern is anti aging, then it depends. If you’re looking to fade wrinkles, fine lines, or dark spots, then again Loreal, I’ve found to be better but if your concern is sagging, dull, dehydrated skin then Olay is a good choice. Hope this helps your query. Do keep me posted and have a nice day!